Of all the superpowers that motherhood brings, being able to provide the best nutrition for your baby is definitely number one on the list. Mee Mee's Easy Expression Manual Breast Pump comes with a unique 'One Way Airflow' system that makes this pump the obvious choice for you. The soft textured silicone shield helps in stimulating the breast and protects air from entering inside that can contaminate the milk. The 'Squeeze & Hold' function makes pumping easy and natural as you can control the pumping rhythm. It is also clinically proven to give you maximum milk flow through its massaging action. Recommended by IMAPH and certified by BIS (Bureau of Indian Standards) and ISI, this pump is sure to make your journey into motherhood easier. 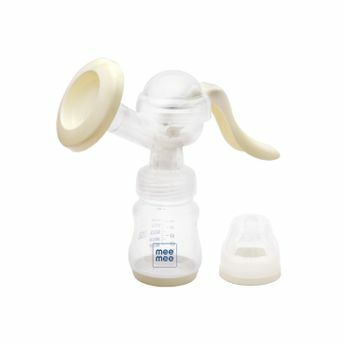 Before and after use: Dismantle the pump and wash all parts like silicone shield, extraction bottle, teat and pump parts that come in contact with the milk with warm water and Mee Mee Liquid Cleanser. Sterilise the parts with the help of Mee Mee Steam Steriliser. Store the freshly expressed milk in a clean bottle for up to 4 hours in a cool and dry place. Milk can be refrigerated up to 72 hours for a later feed*. Milk can be frozen for use up to 3 months*.